Right now, you're thinking, "New Year's Resolution? I made one of those, but I haven't thought about it in months." You've been plugging away at your 2018 fitness goals, but now that fall is approaching, the holidays are coming, and things are getting busy, you're thinking, "How am I going to keep up with this until December 31st?" You didn't make a New Year's resolution in 2018. 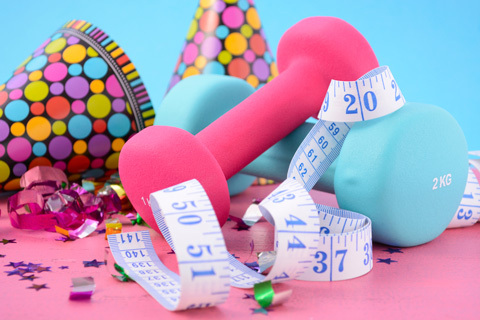 You've decided that you want to get fit, but you don't want to wait until you're thinking about 2019 resolutions to make it a priority. You're doing great with your fitness goals, have no trouble with motivation, and feel like you'll be able to sail through the rest of the year and hit your goals (we can all use some extra tips in our fitness arsenal, just in case). Below are six quick tips for beginning or maintaining a fitness routine as the year winds down. When it's October and you're struggling with your fitness objectives, it helps to sit down, refocus, and rewrite your goals. Think about your "why." Why did you want to make a resolution in the first place? What made you excited to get started back in January? Write it down, and display it prominently. You can recapture the excitement and focus you had at the beginning of the year if you spend some time considering your goals and why you want to reach them. Skip the negative self-talk. Don't dwell on the time you may have lost working toward your fitness goal. Don't berate yourself for not having done more. Remember that fitness is a long-term, constant task, and any time you spend on it, even if you have had setbacks, serves to make you healthier and stronger. Focus on positive self-talk; what is one small thing you can do today, one not-so-great choice that you could replace with a healthier one? Start there, and talk yourself up about accomplishing it. Positive reinforcement works better than negative, even for self-training. Someone you know is very likely to be struggling with end-of-year motivation, too. Find that person and commit to using the buddy system. Send each other positive, encouraging texts or Facebook messages at the beginning of the day. Brag to your buddy when you accomplish a fitness task for the day. 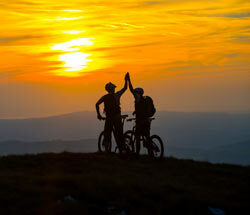 Everything in life is easier with support from like-minded people. These people may be different for varying aspects of your life. Find one who can encourage you and motivate you in your fitness goals, and do the same for them. Write down or otherwise keep track of your successes. It doesn't matter if it's big, like "Ran 5 miles today," or small, like "Ate a banana instead of a cookie at the office today." Write it down so you can see how many positive decisions you actually make for yourself every day. Seeing them written down will encourage you to make more great choices, even if it's just so you can write them down. If you don't already have a morning routine that includes fitness, strongly consider developing one. Getting up, getting going, and getting your workout done in the morning can have dramatic effects on your overall health and whether or not you reach your fitness goals. If you need help developing a routine or want to know more about why it's important, take a look at our article "Morning Glory: Healthy Beginnings for a Healthy Day." A pedometer is an incredibly motivating little device. When you can see your steps adding up, it really encourages you to keep walking. Just 8000 steps a day can make a huge difference in meeting your fitness goals. 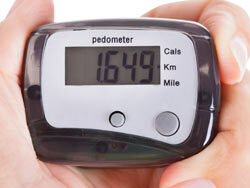 It's easy to over-estimate how much walking you do when you aren't wearing a pedometer. You might take the elevator instead of the stairs and park in the spot closest to the store entrance to save time. But when you know that little device is monitoring your steps, you will find yourself thinking of small and big ways to maximize the number you displayed on it at the end of the day. You can get a pedometer for free when while supplies last when you order any weight loss product. And speaking of weight loss products: if weight loss was part of your 2018 goals, you can give your exercise routine a kick by using this Garcinia cambogia supplement. 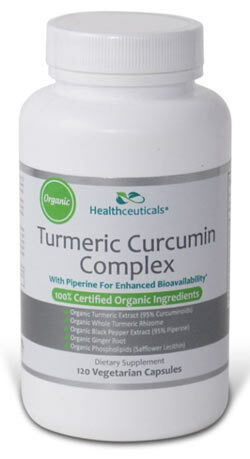 This product helps you lose weight by inhibiting fat formation. It also increases serotonin levels in the body, so it can decrease cravings and emotional eating. It is a great kick start to a new weight loss routine or a boost to an old one. Plus, if you order it, you can get a free pedometer while supplies last. Following these six tips can get you refocused, re-energized, and back on track for finishing strong with your 2018 fitness goals.